Selfridges during Christmas 2017. Thankfully those exterior lights are not yet up for this year. London may be sweltering in 30°c+ heat right now, but Selfridges is one step ahead of the game, opening its Christmas shop already. 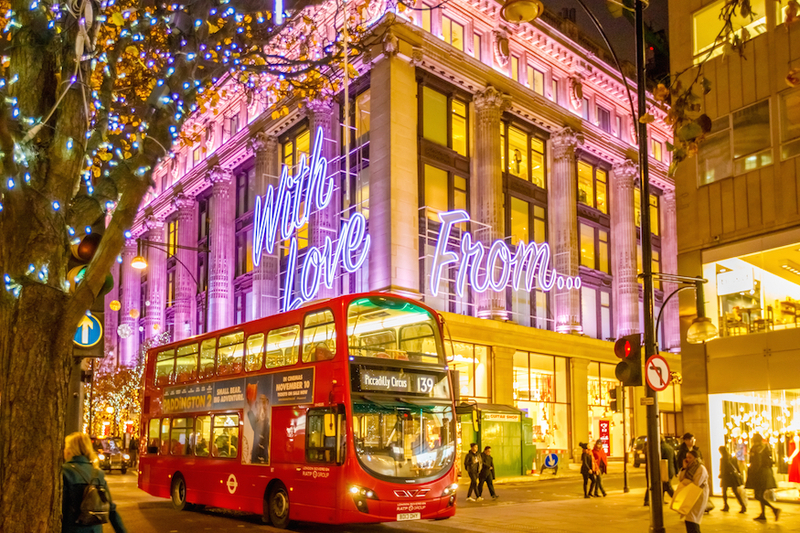 The Oxford Street department store has gone with the theme 'Selfridges Rocks Christmas' for 2018, promising us "a wild one this year". If the Instagram posts coming out of the store are anything to go by (sorry, we can't quite bring ourselves to head in there just yet), trees, baubles and decorations are all up and ready to be rung through the tills. Why so early? The cynical among us may say it's all one massive publicity stunt, but the store claims it's to allow foreign tourists and fans of the store to stock up on their tinsel and baubles while they're in town for their summer break. These results, which come up on the #Selfridges hashtag on Instagram sum up the situation quite nicely — ice lollies and Christmas trees, side by side. If anyone needs us, we'll be inhaling ice creams and jugs of Pimm's in a desperate bid to cling on to summer.